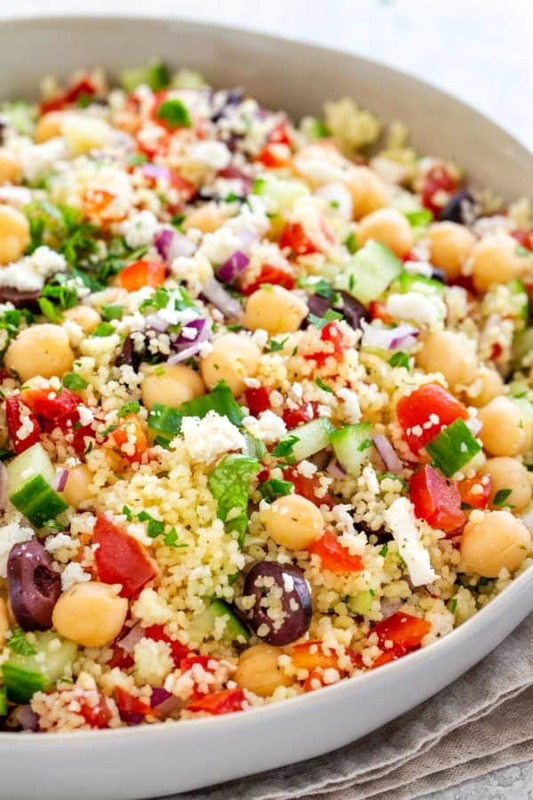 Mediterranean couscous salad with a fresh lemon herb dressing. Tiny durum wheat semolina cooks on the stovetop then gets tossed with colorful vegetables, feta cheese, olives, and garbanzo beans. A healthy side dish that packs a crunch! 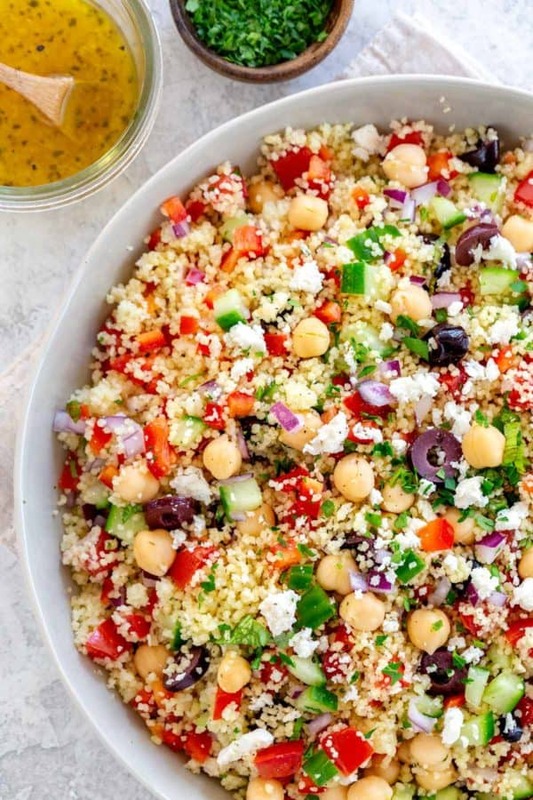 This Mediterranean couscous salad strikes the perfect balance of phytonutrients and fiber-rich vegetables plus protein that makes this salad light yet satisfying. This vegetarian side dish celebrates the use of fresh and flavorful ingredients with each bite delivering a burst of flavor. Couscous is an underutilized pantry item. It’s a staple in regions like Morocco and Northern Africa, but we often forget how versatile it is to use in our daily meals. The good news if you pick up a package of instant couscous, it only takes 5 minutes to absorb hot water and turn into tender grains. Couscous has a lovely nuttiness and acts like little sponges, selfishly soaking up the citrus dressing for your benefit. It’s a wonderful solution when you’re needing a quick and light meal. Allow couscous to absorb hot water until tender. Combine with vegetables, garbanzo beans, herbs, and feta. Combine lemon zest, lemon juice, vinegar, salt and pepper. Toss with lemon herb dressing. 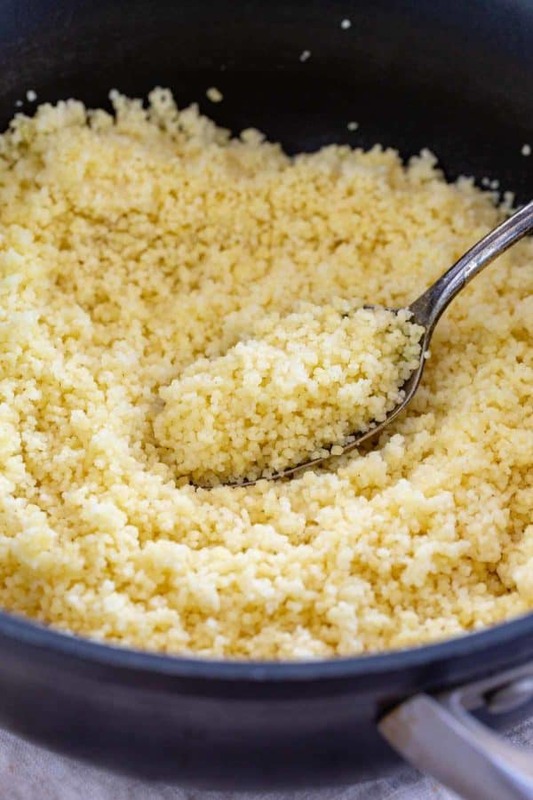 No, couscous is crushed durum wheat semolina that is formed into tiny spheres. It’s much smaller compared to traditional Italian pasta. There are different types of couscous available, and depending on the size can yield a more delicate or chewier experience. With the instant variety, the stovetop method cooks in just 5 minutes of covered soaking in hot water, then it’s ready to add into the salad once cooled. The microwave method just involves heating water to near boiling, then stirring in couscous, covering, and sitting until light and fluffy. It’s an extremely convenient starch to use, that pleasantly absorbs the salad dressing for super flavor bites. How do you make lemon herb dressing? A combination of fresh lemon zest and juice, red wine vinegar, herbs, and extra virgin olive oil provides a nice tang to the salad. The ingredients are whisked to create a quick emulsified dressing. The recipe makes just enough salad dressing to coat the components, but you can always double the amount if you would like to serve more on the side. If you have extra, a few slices of lemon to squeeze on top would be nice to serve at the table. 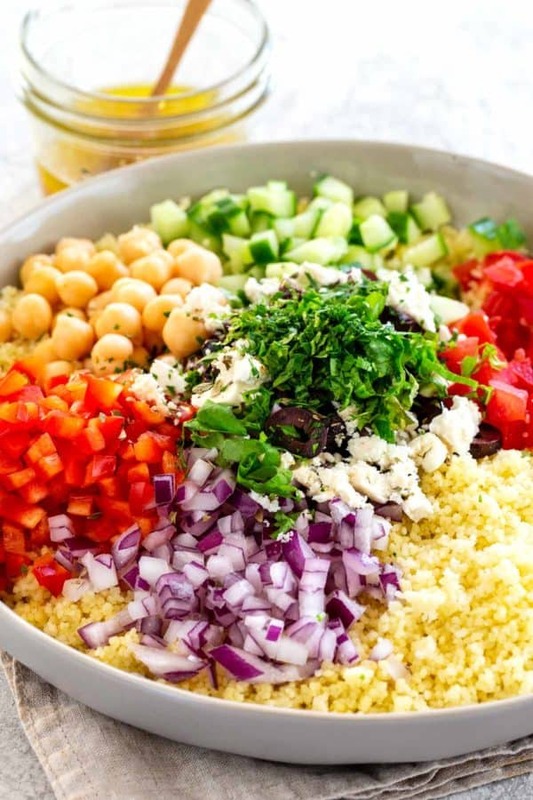 What ingredients do you add to couscous salad? To infuse Mediterranean flavors, I add a hearty amount of red bell pepper, red onion, cucumbers, ripe tomatoes, kalamata olives, and feta cheese. Freshly chopped herbs like mint, basil, and parsley add fragrant aromas, while dried oregano adds an earthy taste. Garbanzo beans or chickpeas add a source of vegetarian protein and creaminess. Instant Moroccan couscous is pre-cooked, compared to the traditional varieties. This means that you don’t need continuous boiling or simmering, otherwise the texture will become overcooked and mushy. Just a simply stir and sit in hot water will perfectly cook them. Mediterranean couscous salad with a fresh lemon herb dressing. Tossed with colorful vegetables, feta cheese, olives, and garbanzo beans. Bring water, salt, and olive oil to a boil in a medium saucepan. Add couscous and stir quickly. Turn off the heat and cover. Let couscous stand until tender, 5 minutes and then fluff with a fork and let cool. Combine couscous, tomatoes, cucumber, bell pepper, garbanzo beans, red onion, olives, cheese, parsley, mint, basil, and oregano in a medium bowl. Whisk together lemon zest, lemon juice, vinegar, salt, and pepper in a small bowl. Pour dressing over the couscous salad, stir to combine. This recipe uses instant Moroccan couscous, but Israeli pearl or Lebanese can be substituted. Other types of vinegar can be used like white wine vinegar, apple cider, or balsamic vinegar. The dressing can be doubled, reserving half for serving on the side. MAKE IT LOW CARB: Use 2 1/2 cups cauliflower rice instead of couscous. You can eat raw or saute and then add with the vegetables. This also lends itself beautifully using Orzo in place of the couscous (which I’m not partial to). Refreshing, and a great way to enjoy fresh veggies. I love the suggestion of using orzo! I love the idea of using cauliflower rice instead of the couscous for a low carb option! If I make this the day before brunch, do you think I should wait to toss with the dressing right before serving? Yes! I would wait to add in the dressing, and if you can add in the onions later that would be good as well. Thank you! I ended up making it all this morning & it was delicious!